The 38.16 metre motor yacht Northlander, jointly listed for sale by Moonen Brokerage and Camper & Nicholsons, has been sold with Jim Acher at bluewater representing the buyer. Northlander was built in steel and aluminium by Dutch shipyard Moonen to a design by Rene van der Velden and launched in 2009, going on to become a finalist at the 2010 ShowBoats Design Awards. Refitted in Spring 2013, a spectacular interior by Art-Line accommodates 10 guests in five cabins. These are configured as a main deck master suite, VIP suite, a double and two twins. All cabins have full en suite bathroom facilities. A centrally installed Crestron entertainment distribution system with a Kaleidescape server provides all areas with music and video on demand. The main saloon’s lounge area is paneled in cherry wood and has comfortable seating, large windows allowing the light to flood in, a bar and an entertainment system while forward is a formal dining area for 10 guests. A sheltered aft deck has all the facilities for al fresco entertaining and dining including built in seating and a pedestal mounted table. The bridge deck saloon has large settees lining the walls and facing a drop down flat screen television while the sun deck offers a whirlpool spa, a bar, barbecue and sun pads with built in loudspeakers. A thoughtful touch here is tempered glass fitted to the lower half of the handrails, sheltering this area from breezes. Northlander is the first Moonen yacht to feature a dramatic central atrium walled in wood and glass that floods all four decks with light and incorporates an opening skylight column. Twin 1,087hp MTU engines give her a range of 5,600 nautical miles at eight knots. 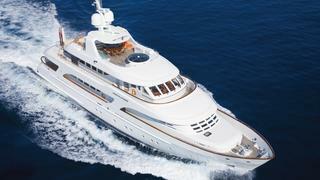 Lying in Nassau, the Bahamas, Northlander was asking $14.7 million.